Transcriptions of the copied Newspaper articles below. I would like to know when and what newspaper this is from. I would really like to get a good copy of the picture of Martin Alexander Weems and Livvia Kenney. From her dress and hairstyle, the picture could have been taken around 1876 which is the year they were married. “Uncle Mart” Weems and his wife Livia, made a substantial place for their family in this community. They are the parents of Price Weems, active in the Neosho Methodist Church, and secretary of the National Farm Loan Association. The log house, which originally housed the first meetings of the Wanda Methodist Church, was built by Martin’s grandfather, Jonas, and later became part of the present Price Weems rural residence. Rhoda Weems has been honored for more than a century as the woman who had the courage to continue the trip to a new land, after her husband, Rev. John Weems, died enroute. Her descendants say that she always minimized the courage - told them that if she hadn't been scared of trying to re-cross the Mississippi River, she'd have turned back - but they doubt it. She later married Zeke Carter. Her home was part of the present site of Stella. Wright Weems, the son of the original Jonas, will be honored Sunday as the man who made sure that land for the school and church of Wanda community was properly deeded to the Wanda Methodist Episcopal Church. 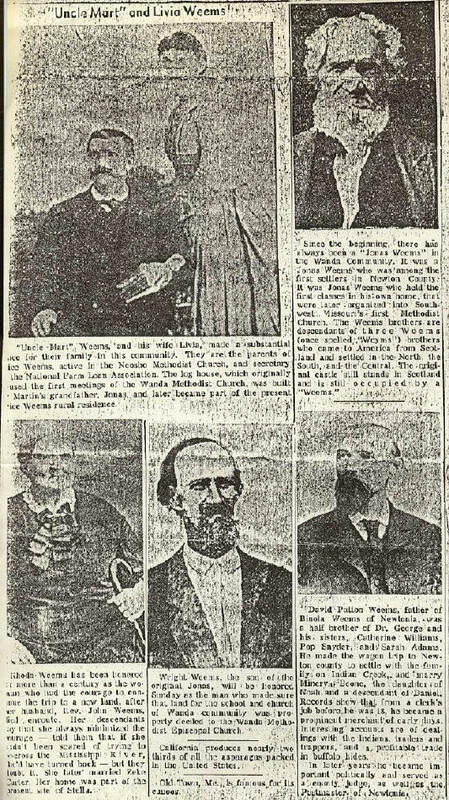 David Patton Weems, father of Binola Weems of Newtonia, was a half brother of Dr. George and his sisters, Catherine Williams, Pop Snyder, and Sarah Adams. He made the wagon trip to Newton county to settle with the family on Indian Creek, and marry Minerva Boone, the daughter of Noah and a descendant of Daniel. Records show that from a clerk's job before he was 18, he became a prominent merchant of early days. Interesting accounts are of dealings with the Indians, traders and trappers, and a profitable trade in buffalo hides. In later years he became important politically and served as a county judge, as well as the Postmaster of Newtonia. What newspaper is this? I want a better copy of the picture of Martin and Livvia Weems.